With a few 1960’s CK trucks listed on the Classifieds page today, I thought I would add some basic information about them. The first Bowtie truck listed is a project truck that needs a complete rebuild. That’s not all bad, it can give you something to do for a hobby or a bonding project with your kid. 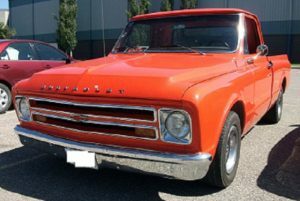 The 1964 CK1500 was part of the first generation of Chevrolet C/K trucks, which ran from 1960 through 1966. There were a few changes on the ’64 CK: the wraparound windshield was flattened out and lost a little width, the grill was redesigned, and there were some small changes in the interior design, while the body style remained unchanged. Body sheet metal that wasn’t supposed to rust as easily as previous models. A coil spring trailing arm suspension replaced traditional leaf springs, as an option, for a smoother ride. It was the only year that featured the smaller rear window. While not originally intended to be covered in this article – here are the basics on the third and fourth gen Chevy CK trucks – because it would seem incomplete and kind of wrong to leave them out without a mention. The third generation of C/Ks started in 1973 and ran through 1987. The fourth generation CKs were produced from 1988 until 1998. Interested in Buying or Selling a Classic Truck? Part of the reason Classic Cars Online US exists is to help connect classic car buyers and sellers, and we’ve added several ways for you to connect – pick your favorite, or join us in all four places: (1) sign up on the Classifieds page here on the site, (2) visit and like this site’s Facebook page, (3) the Best Classic Cars for Sale page or (4) join the Classic Cars Online: Classic Cars for Sale group if you are looking to buy or sell a classic truck.